1) The Hand and Malt Brewing Company—a pioneering craft brewer on the outskirts of Seoul—is branching out into cider. 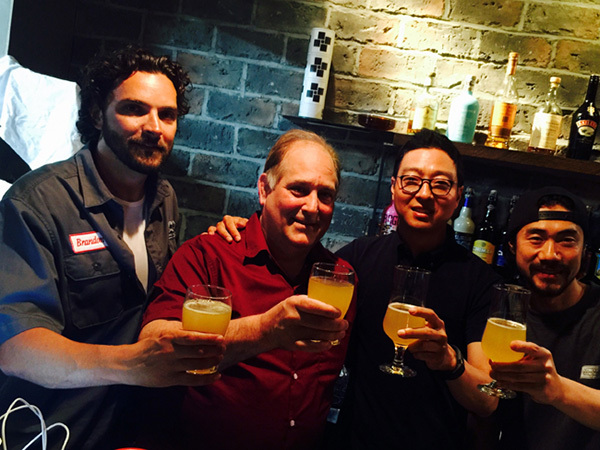 Learn more about The Hand and Apple Hard Cider in Local microbrewery creates Korea’s first native cider, and follow The Hand and Apple on Facebook for updates. 2) “Angry Orchard definitely built the industry for us. But now the craft guys are coming in and taking that market share.” Colin Schilling and other industry stakeholders share their thoughts with Newsweek in Hard Cider, Craft Beer’s Upstart Cousin, is Booming. 3) Austin Eastciders expands into new South Austin headquarters, Blackduck Cidery in the Finger Lakes opens its on-site tasting room, and Ash & Elm Cider Co. in Indianapolis celebrates its grand opening. 4) Cider Chat interviews Shannon Edgar and Ben Roberts-Sano of Stormalong Hard Cider in Sherborn, Massachusetts. And Episode 5 of the Portland Beer Podcast is about Oregon Cider Week and More. 6) The Bristol Cider Shop is on the move to a larger space that will accommodate tastings, dinners, and other events. And the Three Counties Cider Shop is now curated by The Cider Core—a passionate cooperative of cidermakers that includes Gregg’s Pit, Oliver’s, Once Upon a Tree, and Wilce’s. Follow @TheCiderCore on Twitter for updates. 7) Scotland’s Thistly Cross Cider has teamed up with Strathearn Distillery to offer a cider spirit matured in oak casks. Learn more in Is it cider? Is it brandy? No, it’s Scottish Cider Brandy! 8) The double-decker Somerset Cider Bus is a fixture at the Glastonbury Festival. The festival—which runs through Sunday and features an impressive music lineup—has a reputation for wet and muddy conditions. Follow theciderbus on Instagram for updates. Also in England this weekend is the Northampton Sausage and Cider Festival, with its custom “cider shed” pouring machines to rapidly dispense bag-in-box ciders. 10) Along Came a Cider reviews Angry Orchard’s Knotty Pear. Cider Says shares tasting notes from a flight at Schilling Cider House, shares more tasting notes for Merridale House Craft Cider, Gowans 1876 Heirloom, and Raven’s Moon Apple Raspberry, and reviews NV Cider Watermelon Hard Pear Cider, AEppelTreow Kinglet Bitter and Left Field Little Dry. The Milled Apple reviews Domaine de la Minotière Cidre Fermier Bio Doux. Cider Steve reviews Butford Organics Himalia 2013. And Sipology reviews Blake’s Amshiré Ice Cider.